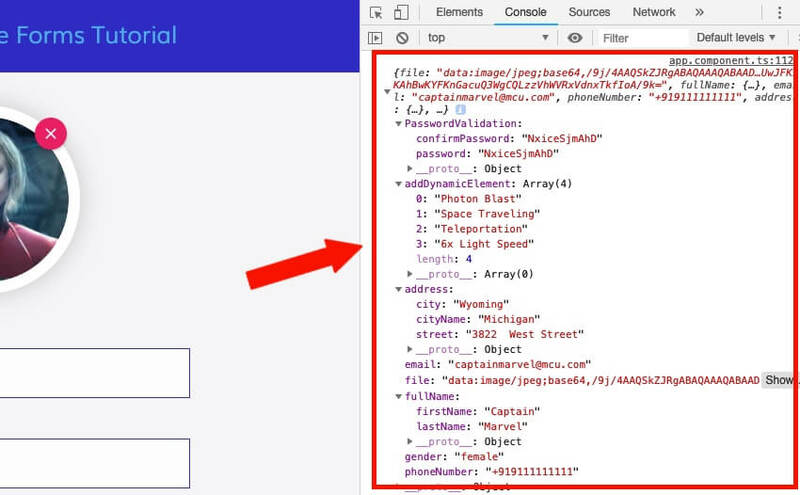 In this tutorial, I am going to create an advance form using Angular 7 Reactive Form with ReactiveFormsModule API from scratch. I will go through the common concepts of Angular 7 Reactive Forms like FormGroup, FormControl, FormBuilder, and FormaArray to manage user’s input data. There are 2 types of Forms in Angular, Reactive Forms & Template Driven Forms, I will talk about Reactive Forms in this tutorial. Reactive forms In Angular follows model-driven approach to handle form data. Reactive forms offer more flexibility then template driven forms. Initially Reactive Form is complicated but once you are familiar with Reactive Forms, then you can easily manage the complex data. In order to work with Reactive Forms in Angular 7 we must import ReactiveFormsModule API in app module file. AbstractControl: This is the main class for controlling the behavior and properties of, FormGroup, FormControl, and FormArray. FormBuilder: It provides helpful methods to create control instances in Angular 7 Reactive Forms. FormGroup: FormGroup is a top-level API which maintains the values, properties and validation state of a group of AbstractControl instance in Angular 7. FormControl: It communicates with an HTML Form element like input or select tag, this api handles the individual form value and validation state. FormArray: FormArray API maintains the values, properties and validation state of an array of the AbstractControl instances. ngSubmit: This event is called when the form is submitted. The FormBuilder service offers 3 useful methods: group(), control(), and array(). These methods generate instances in your component classes including form controls, form groups, and form arrays. Let’s create a file upload functionality using Reactive Forms in Angular 7. I am going to use HTML5 FileReader, changeDetectorRef, @ViewChild() API’s. HTML5 FileReader API: This API is very useful to upload images and files from the client side in the web browser. Here is the detailed article about HTML5 FileReader API. @ViewChild(): If you wish to gain access to a DOM element, directive or component from a parent component class then you rely on Angular 7 ViewChild. Read more about Angular 7 ViewChild. Note: I am saving base64 url in file’s form control array just for demo purpose. You should not save base64 file url in real world app, it will consume more memory and its also not good from SEO point of view. Rather you should save your file in the database storage and include the file location URL in the file field. When we work on select dropdown in Angular application, we must set dynamic values in the form control array. Since the user can select any values from the dropdown list we should use setValue() method to assign the dynamic values to form control array. I am going to share with you how you can work with radio buttons in Angular. Let’s understand how you can set dynamic values of a radio button using setValue() method. <input id="male" type="radio" class="custom-control-input" name="gender" formControlName="gender" value="male"
How to Set Selected Value of Radio Buttons using Angular Reactive Forms? Pass the radio button value name within the form control array, to set the selected value in radio button using Angular 7. Creating dynamic form fields in Angular is very easy we just have to use formArrayName & FormArray service it will allow us to create dynamic form fields. Angular’s Validators class offers some useful validators like pattern required, minLength and maxLength. However, sometimes we require to use validate some complex values. In this type of condition, custom validators are very useful. Reactive Forms in Angular lets us define custom validators very easily. In this tutorial, I am going to create confirm password validation. To do that I will be creating a separate folder by the name of must-match and keep my custom validator file there. I will name it validate-password.ts so it will sound generic. Implementing form validation using Reactive Forms in Angular is pretty easy. In order to add form validation in Angular we must import Validators class in Angular app. Validators class communicates directly with form control instance, It wraps single or multiple validation into an array. <select class="custom-select d-block w-100" (change)="changeCity($event)" formControlName="cityName"
Below file contains the entire logic of our Angular Reactive Forms.